A sermon preached on Christmas Eve at Southminster Presbyterian Church in Boise, Idaho. But this text is not really about comfortable feelings or going home for the holidays. This text is about going away for the holidays. It is 8 hours stuck at the Newark airport. People are leaving their homes and lives, going to uncomfortable and unfamiliar locations. From Mary and Joseph to the Shepherds, people are being sent into unknown futures in this passage. For Palestinians in the first century, or for Palestinians today—for that matter—decrees from the Emperor were not good news. This census is about taxation, and Joseph and Mary have to inconvenience themselves at a rather important moment in their lives so that the occupying Roman authorities will be able to properly tax them. Insult to injury. It does make me wonder, though. As 9 month pregnant Mary was trying to stay comfortable while riding a donkey over the Judean hills, did she ponder the angel’s pronouncement that heralded the beginning of her pregnancy 9 months earlier? Did she ponder in her heart if it must have been some sort of dream? Because even if you can get your mind around the fact that you, a teenager from Nazareth, are going to become the mother of God, don’t you think you’d start wondering when the perks that came with the job were going to arrive? 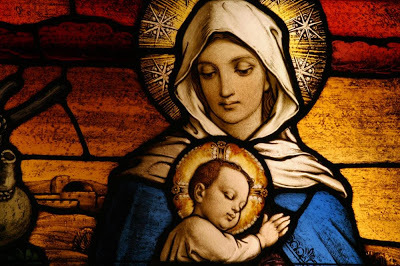 I suspect that the dislocation to Bethlehem as I were about to give birth would make me pause and ponder—this is how it goes when you’re the mother of God? Really? And then, after she’s wrapped her baby in cloths she’s pulled out of her suitcase, and tries to make herself as comfortable as you can be in a barn, they receive company! Just what every woman wants right after she’s given birth—shepherds! And the poor shepherds. Think how awkward and dislocating it must have been for them. These shepherds had been minding their own business in the fields, keeping watch over their flocks by night, when they had the wits scared out of them. And the angel says what angels always seem to have to say, “Do not fear”. And so these shepherds pull themselves together to listen to the angel’s news. And after the angel makes the pronouncement of what they will find in the city of David, a multitude of the heavenly host shows up singing. Not an average night on the mountain side, we can safely guess. At this point, the shepherds could have sat around the campfire and made a pact that the crazy things they had just seen would never leave the campfire—what happens in Bethlehem stays in Bethlehem, as it were—Instead, they decide to go see for themselves if the angel was right. It isn’t often, it isn’t EVER, that shepherds are the good news bearers in ancient society. The angel could have appeared at the country club. Or at the Temple. Or at the capital building. Or in Hollywood. But the angel and the heavenly host did not go to the halls of power or influence. They went to people with no voice. People who were more comfortable with livestock than with humans become the bearers of the good news. And this news, the shepherds realized, was too important to remain in Bethlehem. Because this good news wasn’t just for the people who already had the monopoly on good news. This was good news for all people. This is such a different message than the shepherds had experienced in their lives. I wonder what they were pondering as they treasured that message in their hearts. So, Mary’s resting in the stable when in walk the shepherds. These shepherds look like they have just seen a ghost. Or perhaps an entire multitude of them. They silently walk into the barn, as if they’re afraid of what they’ll find there. And then, when they see the new family, gathered around the feeding trough that holds a baby, they all start talking at once. Mary and Joseph can hardly understand them as they try to distinguish which words belong to which voice. Perhaps she looked at her son, asleep in the hay, and began to realize he wasn’t someone she was really going to get to know as much as someone she would spend a long time pondering. I applaud, maybe even secretly admire, the people who speak with confidence of “knowing Jesus”. The clarity in their declarations about how ‘easy’ faith is and their unwavering confidence that all we have to do is ‘know Jesus’ are not my experience of faith. But Jesus confounds me at every turn. God’s message of grace, peace, and truth is denied in almost every area of our culture and politics. Yet I catch glimpses of it in unexpected generosity, in sacred moments, and so I keep on following. I keep on seeking. If you are one of those people with a sure and certain faith, you just keep on keeping on. Because the world needs your clarity and hope. I know many people, however, who leave religion all together when their faith is not sure and certain and they think that is what is expected. And I know others who stick with it, but often feel inadequate or not quite faithful enough because they ponder and they wonder and they question and they doubt about things that don’t quite make sense by the world’s logic. And so if faith isn’t about certainty for you, I want to encourage you to be okay with that. The shepherds encountered mystery and it led them on a journey, although I’m not sure how clear it seemed to them as they were in the midst of it. And Mary was a ponderer. Mary treasured all these things and pondered them in her heart. She doesn’t give a lecture on 10 easy ways to know Jesus. She leaves space for mystery and acknowledges that this is not, in any way shape or form, how she thought it was going to happen. The entire Christmas story is one of wonder and pondering and mystery. Any certainty is only in the knowledge that the world is not as it seemed to be before God became flesh. He then goes on to quote Poet Christian Wyman from the book, My Bright Abyss: Meditation of a Modern Believer. That’s what I hear in the Christmas story. From census to manger to shepherds to angels, the entire story reveals moments where reason loses its claim on us, and it then reminds us of those other times in our life where we have been in the presence of unknowable mystery. I don’t know how you see organized religion or faith. I don’t know if it all comes easily to you or if it leaves you confounded. You may be here tonight because you’re here every week or you may be here tonight because you’re making your grandmother happy. It’s all good. No matter how or why you decided to be here tonight, we have all been invited into the mystery of this story. This night, as we leave here in candlelit silence to go home and await Christmas, I pray you will leave time for treasuring those moments we can’t explain, pondering them in your heart. May it lead you through doubt, through questions, through certainty, and through mystery, to the Christ child. December 24, 2014 in Christian Wyman, Christmas Eve, David Brooks, Luke 2:1-20, Sermon.